HARD to image that three years ago, both Wolfe Tones and Clarecastle squared up to each other in the county final. 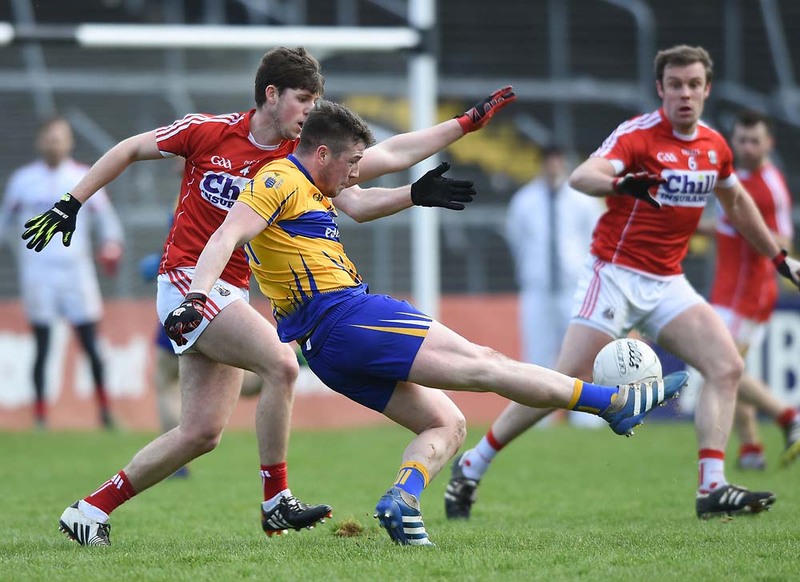 Last Saturday, their meeting in O’Garney Park in Sixmilebridge was at the other end of the spectrum – a battle to avoid relegation. The ignominy of fighting to retain their senior status has befallen Clarecastle and little wonder because of the inability of their full-back line to do the fundamentals well. The ’Tones’ five goals, which came from players positioned in the full-forward line, left the Magpies in a flap and highlighted their defensive frailties under the dropping ball. Clarecastle started brightly and with Tyrone Kearse buzzing about the place they led 0-3 to 0-1 after three minutes. Then they suffered a double whammy through the concession of two goals, one the replica of the other. A Bobby McPhillips free from deep in his own half dropped short and Brendan Hughes flicked the ball to the net. Worse was to follow moments later when Clarecastle were found out in similar circumstances. This time Declan O’Rourke flighted the ball into the danger zone and in nipped Gareth McPhillips to divert the trajectory of the sliothar past a bemused Donagh Murphy. While the keeper was helpless, the full-back line was far from blameless. Tyrone Kearse and Eamon Callinan responded with points but Clarecastle’s defending turned comical once more. However, this time they received a let-off when a second Gareth McPhillips goal, again from an overhead strike, was disallowed because of a square infringement. But there was no denying McPhillips because moments later he received a pass from the industrious Patsy Keyes before unleashing a ferocious shot that flew into the net. Eighteen minutes into the game and things looked ominous for Clarecastle; they had been hit for three goals and looked vulnerable and likely to concede more. Wolfe Tones had stretched their advantage to seven points, 3-4 to 0-6, before Clarecastle were thrown a badly needed lifeline just on half time. Aaron Considine, looking sprightly all through, won possession and waltzed past two defenders before placing an angled drive wide of Donagh Murphy. It was a score the game craved if it was to retain its competitive element. However, any hopes Clarecastle entertained of a comeback were shattered inside 13 minutes of the restart when the ’Tones hit a goal and five points to a solitary point in reply. The goal was excellently taken by Daithi O’Connell, who was then withdrawn further out the field as Wolfe Tones battened down the defensive hatches. It was a case of ‘what we have we hold’ as they set about seeing out time. Clarecastle huffed and puffed without seriously threatening a great deal. They did manage a goal 10 minutes from the finish when Jonathan Clancy was quickest to react to whip home a rebound after a close-in free had been saved. Almost immediately, Wolfe Tones hit their fifth goal. This time, substitute Andrew Moloney won possession and engineered himself into position before finding the net. It was embarrassingly easy and two splendid points from Declan O’Rourke sealed an emphatic result for the ’Tones. Wolfe Tones: Ciarán McDonagh; Gary O’Connell, John Coen, Frank Lohan; Stephen McInerney, Bobby McPhillips, Barry Loughnane; Brian O’Connell, David Reidy; Declan O’Rourke, Patsy Keyes, Gary Leahy; Gareth McPhillips, Brendan Hughes, Daithi O’Connell. Subs: Johnny Bridges for Hughes; Alan Hehir for Leahy; Andrew Moloney for Gareth McPhillips, John Guilfoyle for Reidy. Scorers: Garth McPhillips (2-1); Daithi O’Connell (1-2); Declan O’Rourke (0-4,1f); Brendan Hughes, Andrew Moloney, (1-0); David Reidy, Brian O’Connell, Patsy Keyes and Bobby McPhillips (free) (0-1 each). Yellow cards: Gary Leahy, Gareth McPhillips, John Coen. “I felt we controlled the game once we scored those two early goals. It gave us a cushion.” John Markham, manager. Clarecastle: Donagh Murphy; Mark McNamara, Alan O’Loughlin, Gareth Barry; Kevin Clohessy, Gary Farmer, Danny Scanlon; Jonathan Clancy, Patrick Kelly; Seanie Moloney, Eric Flynn, Tyrone Kearse; Aaron Considine, Derek Quinn, Eamon Callinan. Subs: Seán Talty for Quin; Darragh Moloney for Flynn. Scorers: Jonathan Clancy (1-3); Aaron Considine (1-1); Tyrone Kearse (0-3, 2f); Eamon Callinan (0-2); Seanie Moloney (0-1). “The goals were a killer and you’ll win no game conceding five goals.” Kenny Morrissey, selector.